Whenever we feel like a change in our home or want to add some modern decor items or elements a few times a year, we look at updating the living room, the dining room, the bedrooms and even the kitchen. We are inspired by the different seasons and the latest decor magazines, which may motivate us to redecorate entirely or simply change a few things here and there. You may just want to swap out some curtains, change the sofa covers or add a rustic look and feel to the interior. This is very easy in all of these rooms, but the question is: how do we change and update the bathroom? This is a room that is often overlooked, but it's such an important space! Today we are going to see how several designers have renovated bathrooms, in ways that are both modern and fun. We will witness the old and cracked tiles disappear, the washbasin replaced, the cabinets updated and the bathroom fixtures redesigned. You'll find that when you first see these bathrooms, it will make you want to sigh. Then they will completely transform into brand new bathrooms. Maybe it is time for our own home to experience the winds of change? The colour of the tiles and the walls that are erected around the bathroom show us just how old this design truly is. While the door frame has been painted with purple and orange colours to create a very warm atmosphere, it ends up making the doorway to the bathroom look that much more narrow. The orange tiles used throughout are very outdated and out of fashion, making the whole space look old. They also do nothing to open the space up. While bright colours have the potential to modernise a home, they have failed in this design, instead making it look a bit tacky and old-school. 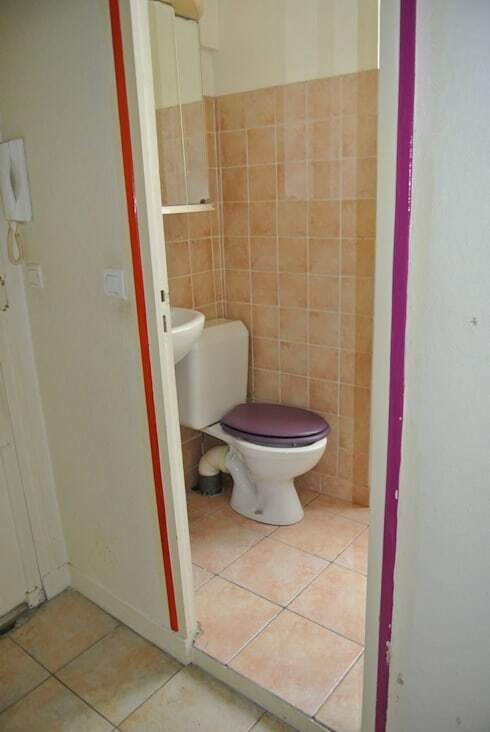 The purple toilet seat is just the cherry on top of a very cheap design that falls flat on its face. The whole atmosphere of the bathroom has changed thanks to Transition Interior Design! Can you even believe that it is the same space? This just goes to show how a modern design can change the whole look and feel of a bathroom. All of the tacky features of the old bathroom are gone and have been replaced with clean and hygienic looking white tiles, walls and floors. This creates a very elegant and minimalist space. Even the bathtub, basin and cabinets are white, with all of the elements coming together in sleek harmony. The large and expansive mirror is a great feature, making the room seem that much bigger. Tip: include a large mirror in any small space in your home and it will add depth and give the perception of space. To break up the monotonous white look, the designers have decorated the space with some colourful African patterned baskets, where toiletries and personal items can be stored neatly out of sight. Functional and beautiful! Now have a look at this photo! Here we can see how past trends have influenced this bathroom design. 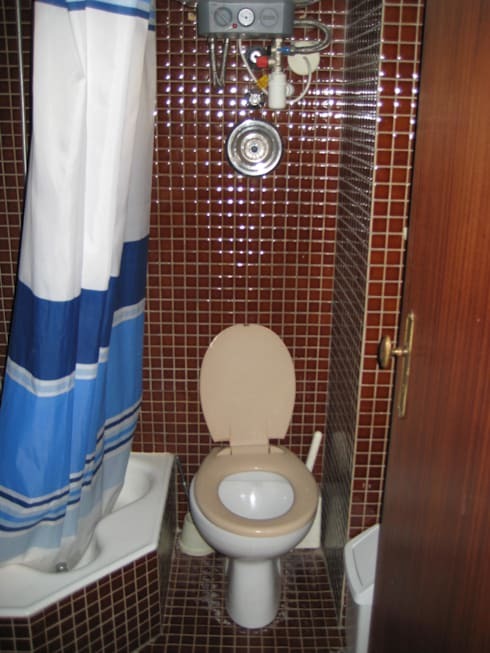 There is a toilet and basin, but there is no toiletries cabinet or storage space for personal items. A vanity cabinet can make a huge difference to a bathroom, but is lacking in this design. The design of this bathroom is very dowdy and old-fashioned, but we can also see that it hasn't been maintained in some time. There are filthy pipes under the sink and the pink tiles need a good polish. This looks nothing like a trendy bathroom! This is why bathrooms and other rooms in the house need to be updated regularly, before they end up looking faded and dull like this one. Don't like these pink tiles? Have a look through: The best materials for the bathroom. The pink tiled bathroom has been completely renovated and transformed into a very trendy and stylish haven. Design Mellow have completely removed all of the pink tiles and have replaced the toilet and sink. They've also included a gorgeous and sleek vanity cabinet above the sink that is very funky and functional. The designers have decorated the bathroom with matt black tiles, which makes it look like a modern art gallery. You may be a little bit concerned about designing your bathroom in black, especially if there is no sunshine streaming through the windows. You don't want it to look too dark or dingy. However, in this image we can see how it creates a very elegant and luxurious atmosphere due to the careful lighting featured throughout. The use of mirrors in the space also breaks up the solid colour. This is the perfect interior bathroom design for those who enjoy a bit of a dramatic effect. Before the renovation of this bathroom, we can see that the walls are made up of small, dark brown tiles that spoil the atmosphere. They are used throughout the entire bathroom! When you go for a dark brown tone in the living room or bedroom, it works wonderfully with antique furniture and stylish flooring. This is a very stylish and classic design! But in the bathroom, it looks like cobblestone and comes across as very heavy and intimidating. This is compounded by the fact that there are no windows and the bathroom is very small in size. The shower curtain, the toilet and the bath are also very old-fashioned, impacting the aesthetics of this space. After Germano de Castro Pinheiro have intervened, the feeling of overcrowding and congestion is gone. We no longer feel like we are stuck in a worm hole! The designers have moved away from the heavy dark brown cobblestone look and feel, transforming it into a modern and bright bathroom. Everything is that much more refined from the mirror-cabinet to the sink to the toilet to the bathtub. 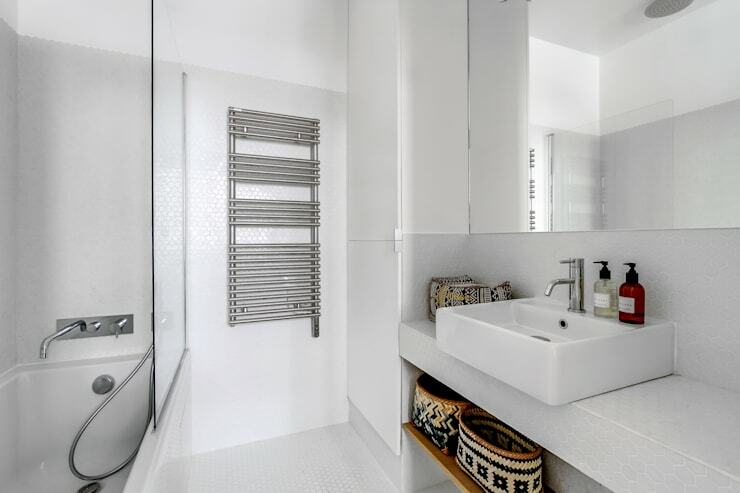 The bathroom also looks that much bigger thanks to the long mirror that runs across the entire length of the wall, which adds incredible depth to the space. The mirror also helps to reflect the lights in the room, which makes it that much lighter and brighter. From a glance, we can see that this bathroom is falling apart. The tiles are falling off of the walls and the side of the bath, the design is very old-fashioned and it seems like there could be mold growing in the corners of the room! Because everything looks like it is falling apart, this space looks very uncomfortable. Construction and renovation is urgently needed in this space. 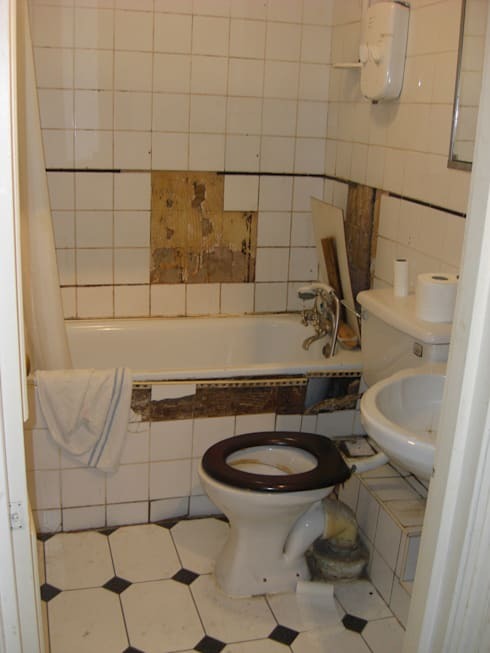 What's important to note here is that if you don't maintain your bathroom, it will end up looking this, which isn't very hygienic or clean. There are also no modern features such as storage spaces for toiletries. There's not even a toilet paper holder! This bathroom, designed by the Lady Builder, has been completely transformed into a hygienic, clean and comfortable bathroom. All of the tiles have been removed from the old bathroom and replaced, while a little bit of construction has opened the bathroom up and created a very elegant space. Don't you love the smooth marble used throughout? The subtle and sophisticated lighting used throughout the bathroom enhances the design, especially the lights used next to the vanity cabinet. 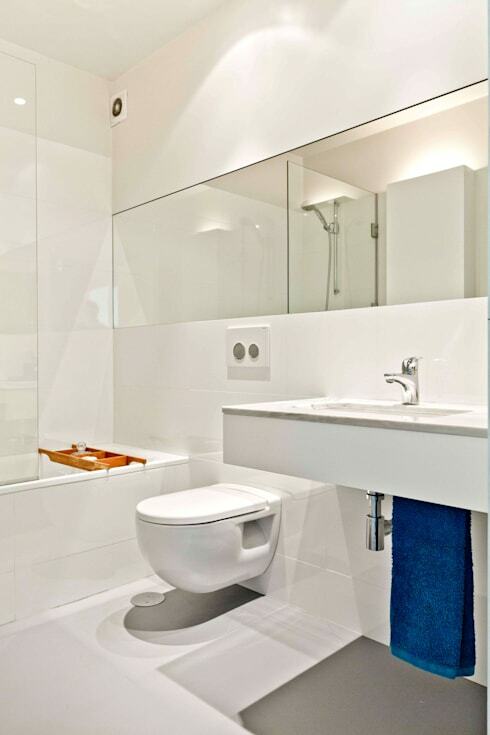 The toilet, sink and bath/shower are also much more modern, finished in crisp white ceramic. A bathroom should always look clean and hygienic! The sleek wooden storage unit under the sink allows for personal toiletries and towels to be stored neatly out of sight—a great tip! If you love these marble floors, have a look at this ideabook on: Which floor for your bathroom? Which transformation do you think is the most dramatic?